In Sirsangi, was the place where Swamiji intends to built a place for meditators called "Tapovan". The entire area of unpolluted nature had beautiful vibrations and i knew somewhere that there could not be an ideal place like this! There was cactus, there was bilva patra trees and there were the real tulsi plants. The leaves when chewed relished a very pure and strong taste of the original tusli leaves. The sky was bright, yet the breeze was cool and everything looked green around and in the near distance could be seen the powerful temple of Kalikadevi. A divine place! On the way,on the high stony hills is the Bhaskaracharya Hill. This was the hill on which Bhaskaracharya did his sadhana. Sogal, is around, 40 kms from here. 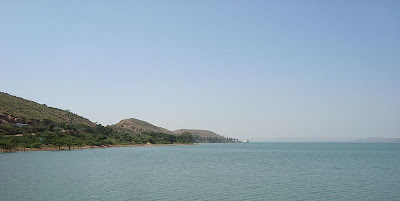 All these places are around the Malaprabha waters, also known as Renukasagar reservoir. All these areas that we traveled, the reservoir was visible, which showed that all these holy lands were situated on it's banks. On the way to Sogal, one can find another ashram of Baba Nityanand of Ganeshpuri, known as Mullur Ashram and this was where Swami Vijayanand lived for more than two years doing his sadhana around here and in the rocky caves of Sogal. This house had just one room and looked like a normal house. A look at the large photo of Baba Nityananda only brought so much of peace and love; his presence was so strong all around in these areas and especially in this little hall. Along with padukas on the altar, there were pictures of many saints and siddhas who lived around. It also had a statue of Sogal ajja, who lived and did sadhana in caves in Sogal where he had taken samadhi. i called up Mohan Swamiji's ashram to see if he was there and fortunately he was there. In half hour one can reach the first part of the Sogal Hill, called "Chikka Someshwara". 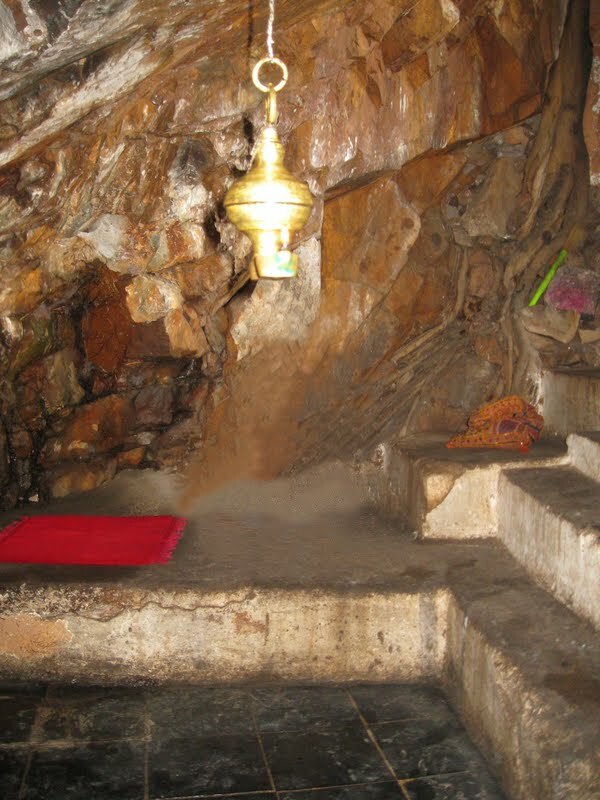 There is a small natural cave here that has a Shivalinga inside the half open cave, on which natural water trickled on the Linga. This place is very isolated and not much of common public come here. This has been a place of tapas of many yogis including those who come and do sadhana for siddhis and practices of the kind. 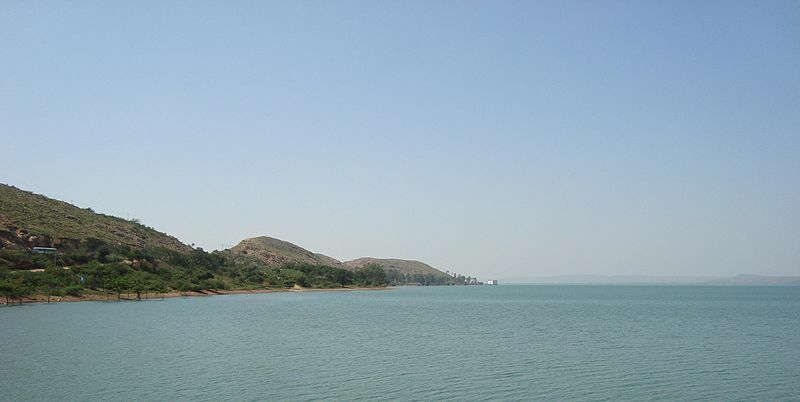 The waters of Renuka Reservoir seen from the entrance of the cave. Cab parked down below. The other side of the hill is Sogal. The climb to the top of this hill over the wide stones steps lead to the temple of Sogal Somnath, which is known to be the meeting place of Shiva and Parvati. This is also a common place to see couples as they tie their nuptial knots here or singles come to ask for a life partner. 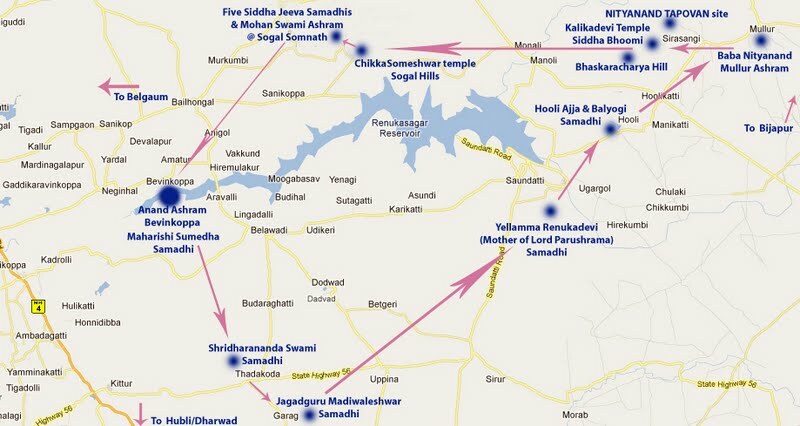 This place also has the ashram of Mohan Swami and 3 Siddha Jeeva Samadhis. Sogal Ajja's place and i was just awed to see this place. The cave entrance led us to a place which looked like and external part of the cave where photos of Ajja and other saints were there. Behind this cave another red-framed door led us to another internal cave. Besides this is the entrance with steps that go down into a long cave. There are no lights in here and one can go in with a torch. At first one walks, then bends and walks and then on knees to the point where around 4 people can comfortably sit at one time. This is the place Ajja used to sit and has a photo of Kalikadevi and a pair of padukas. It seems very obvious that this cave was dug out deep enough where one could not be disturbed. It is said that the Siddha here used to do tapas in here and lived with a cobra and a tiger in this cave. There are separate to enclosures near the seat of the Siddha, which are said to be the snake's and tiger's chambers. Moving out from here, a little walk uphill is Swami Mohan's hut. Besides the hut is the Jeeva Samadhi of Siddha Maatanand Swami. Just opposite to the hut of Mohan Swami are two more Jeeva Samadhis of two disciples of Maatanand Swami. 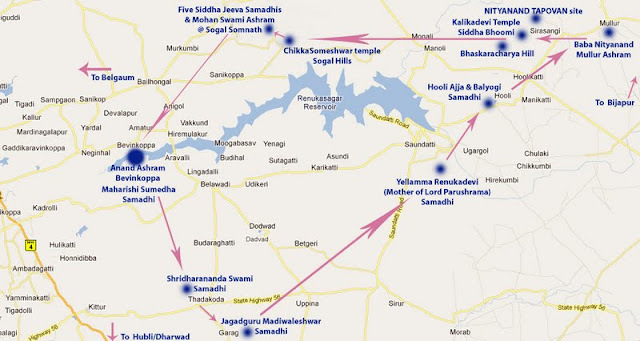 One of this samadhi is of a woman, who was also a Siddha and the disciple of Maatanand Swami. She took samadhi one midnight while the Guru was in his physical body itself, after seeking permission from Him. Once robbers approached Swami Maatananda in this place itself, to make Him reveal the secret of making gold. They insisted on gunpoint that he make gold for them and tell them the secrets or they would kill him. Swami Maatanand was in the state where he saw nothing separate from him and with everything around and thus with the same emotion of unconditional love he said, "Does that give you happiness? If killing me gives you happiness, then i am ready to die not once but thrice." Saying so, he laughed in joy, compassion and love towards the dacoit, who threw his gun and fell at his feet.